A confidential memorandum sent this year to potential investors of GreenTech Automotive reveals that the company was using the Democratic candidate for governor in Virginia Terry McAuliffe for fundraising purposes even after his resignation. The 70-page document was obtained by nonprofit organization Cause of Action and refers to McAuliffe as the chairman of the company, even though he stated through his campaign this April that he had resigned as chairman of the company the previous December. The investor document is dated March 12, 2013, more than three months after the resignation. It informs potential investors that McAuliffe’s political connections are an asset to the company and references him numerous times. The "strictly confidential" memorandum trumpets McAuliffe as a great businessman with an endless web of political connections. "McAuliffe is widely credited with rebuilding, reenergizing and revitalizing the Democratic Party," brags GreenTech. "At age 14, Mr. McAuliffe started his first business, McAuliffe Driveway Maintenance, which sealed residential driveways and commercial parking lots in his local community of Syracuse, New York." 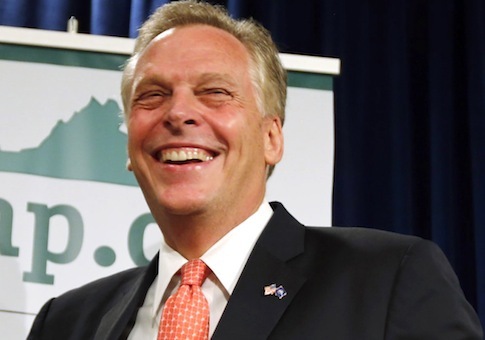 McAuliffe still holds stake in the company and made arrangements regarding his role in the company during his gubernatorial campaign, according to the memorandum. "Until the election, Mr. McAuliffe will dedicate his full time to the election campaign but will remain as a shareholder of GTA’s parent." The document outlines the potential steps that would need to be taken should McAuliffe win the election. "If Mr. McAuliffe becomes governor of Virginia, federal and state law requires that he resign all positions with GTA and appoint a representative to vote his shares of GTA’s parent," it says. "On January 7, 2013, the board of directors of GTA assigned to Mr. McAuliffe as chairman of the company the duties and responsibilities appropriate for a chairman emeritus during the course of his gubernatorial campaign." McAuliffe has been trying to distance himself from the company, as it has become the target of multiple federal investigations and increased scrutiny. This narrative works against McAuliffe, who has been attempting to present himself to Virginia voters as a successful businessman and entrepreneur. This weekend, the Washington Post wrote that the GreenTech failure fits into a long pattern of business ventures where McAuliffe "has used government programs, political connections and access to wealthy investors of both parties in pursuit of big profits for himself." The Post also notes that McAuliffe can be found "often coming out ahead personally, even if some investments fail or become embroiled in controversy." This entry was posted in Politics and tagged GreenTech, Terry McAuliffe. Bookmark the permalink.